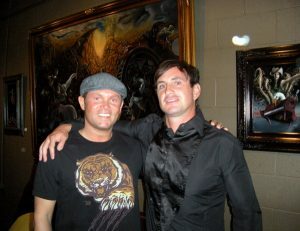 Kickin’ it with mad talented Shay Davis in San Diego @ Mosaic Gallery! Nothing like supporting a friend and truly being blown away by what they produce! Shay Davis is a great dude, but even more so, an amazing painter! I had a blast tonight hanging out at his opening at Mosaic Gallery in the North Park area of San Diego and will be teaming up with him on November 13th to open a new Exhibit at the Gallery! Check my “Exhibitions” section for the details! Hit the sites below for more info and to check out his works! !